My awesome bridesmaids, wedding decor and wedding invites! Thought I’d drop in to revive this blog a bit. Been really busy preparing for the wedding. Yeah, what’s new right? I am so glad & grateful my bunch of bridesmaids have been clocking in so much time helping me with my wedding decorations. 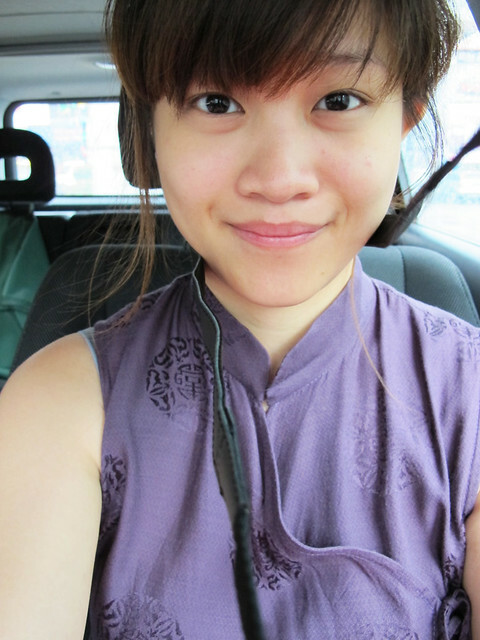 Me being Asian, a bit paiseh to ask for help at first but they all volunteered…I didn’t even have to bribe them with food! Looloo, Jayna, Celine, Lainey, Whey Lu, Ee Laine, Ruby, Yuki, Haze, Carol and Li Ling. Thank you! <3 Speaking of wedding decorations, I have decided to eshew professional wedding decorators. Too expensive!! I just couldn't justify plonking down a sum of money enough for a sweet holiday in Maldives towards frilly stuff that will only be useful for one night. Call me cheapass, but that's how I feel! So I've been to Klang for many times getting supplies. Klang is my new favourite town! I love it for its food, but I love it more now for it's cheap, higher quality DIY/craft supplies! I bought a bunch of fabrics, fake flowers (yeah gasp in horror...but my flowers, which by the way look very realistic will never look wilted in pictures!) and ready-made corsages. 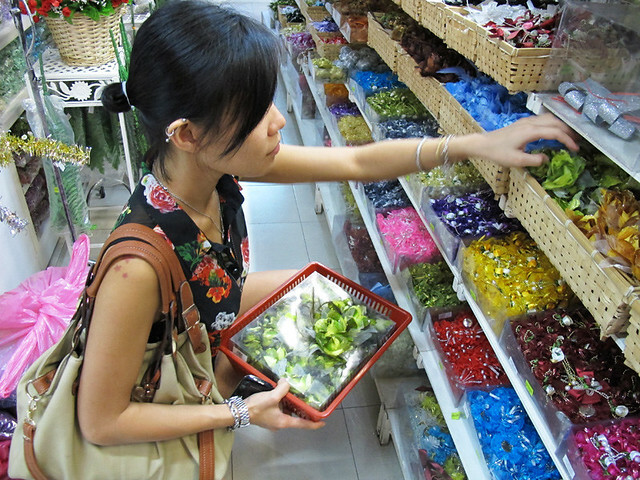 # - Lainey helping me pick out corsages. 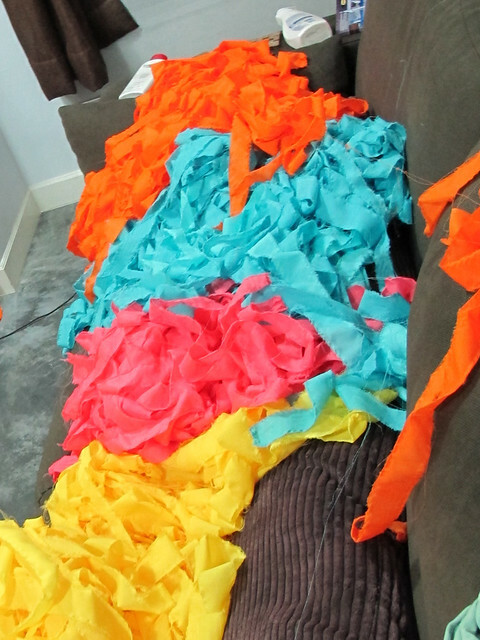 And of course, the girls have been helping me over the weekend, shredding fabrics into streamers and more until their fingers blistered & ached. I feel the love, I really do. HUGS ALL <3 # - Lots and lots and lots of handmade streamers. # – Whey Lu, Celine, Sin Loo and Lainey. Jayna too but she’s not in picture. 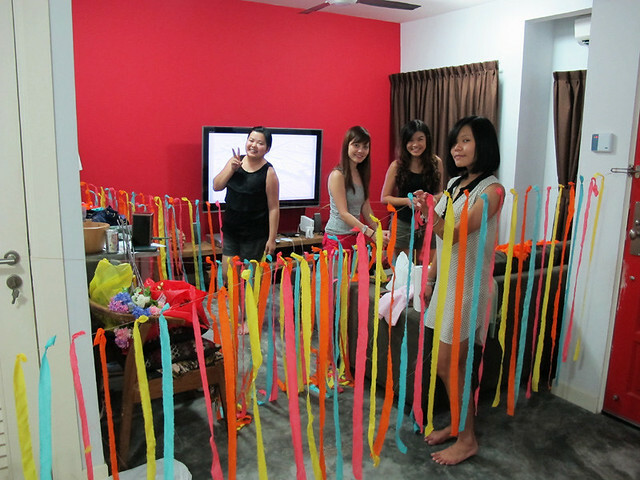 The colour of the streamers are picked out from out wedding invites. Our wedding theme? 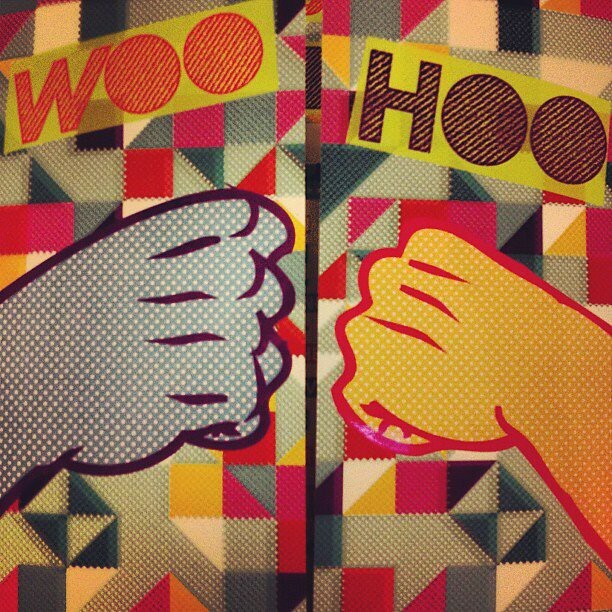 Retro Technicolour Frenzy!!! Ya, I so totally just made that up heh. I love, love, love our invites. It is very us! I love the fist bumps in front because that’s really our thing…we practically fist bump over every gawd damn thing haha. # – WooHoo. 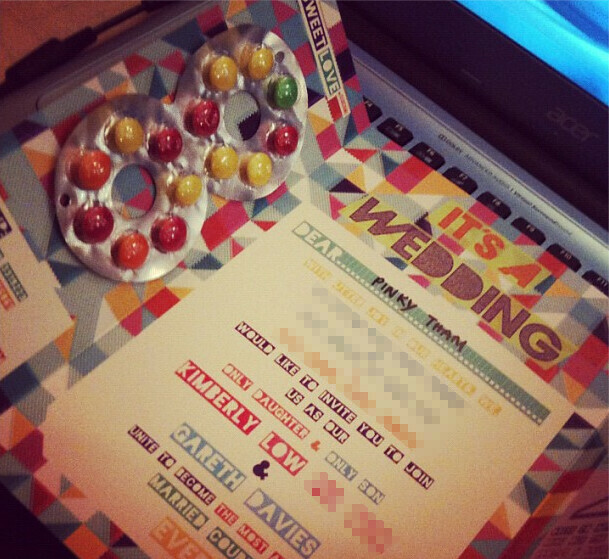 Picture stolen from Chee Ling, our awesomesauce invite designer. We don’t have a favourite colour so we decided on using most of them. We love sweets so we decided to share some. In fact, we tested several brands and the one on the invite is the tastiest one ok! And there’s a bit of geekiness too but only the geeks would spot it. # – The inside of the card…picture stolen from Pinky. I can’t believe it’s a little over 20 days to the wedding! I still have tonnes of stuffs I haven’t done! I haven’t bought dresses for my two flower girls and I haven’t…okay, that’s it!? New camera, wedding bands and Toad in the Hole recipe. I tell you, it seems like the universe is conspiring against me when it comes to blogging. First, my long time camera just stopped performing. # – Abused and used. I mean it still take pictures and all but every picture has a faint line across it and the screen is basically purple now, thanks to hubby sitting on it on a drunken stupor. We’ve used it for almost 3 years? I’m not too sure it seems a looooooooong time and we’ve certainly gotten our money worth. 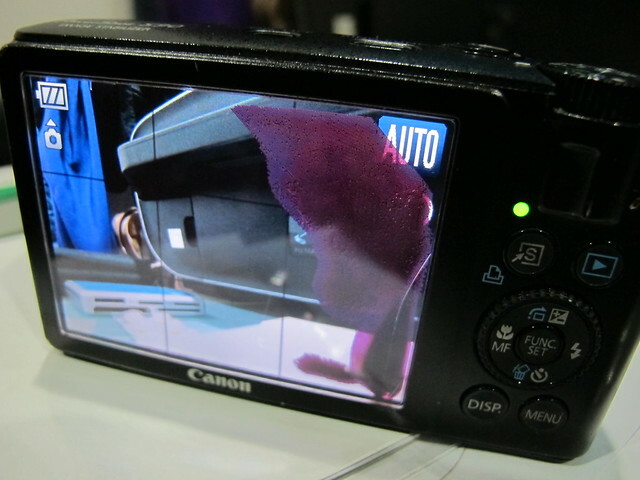 But all is well, we’ve bought the Canon G12. I wanted a camera with flip camera for easy camho so I was thinking of getting the G1X, but after trying it…it’s macro capability is basically laughable. 20cm is not macro, I mean if I had shorter arms I probably wouldn’t be able to camho with it WTF? Stupid. So we decided to go one generation back with the G12…smaller, can take closeups so close it’s crazy and best of all, a lot cheaper. 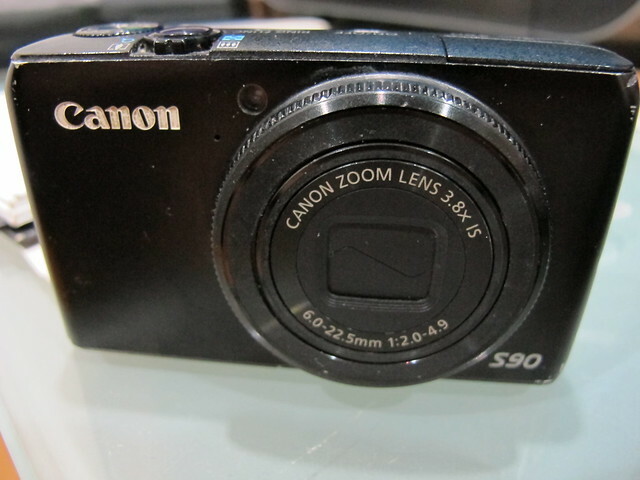 Very happy with the purchase and hopefully, I will start blogging more actively again. # – One of the 1st test shots with the G12 – flip camera for perfect camho yay! 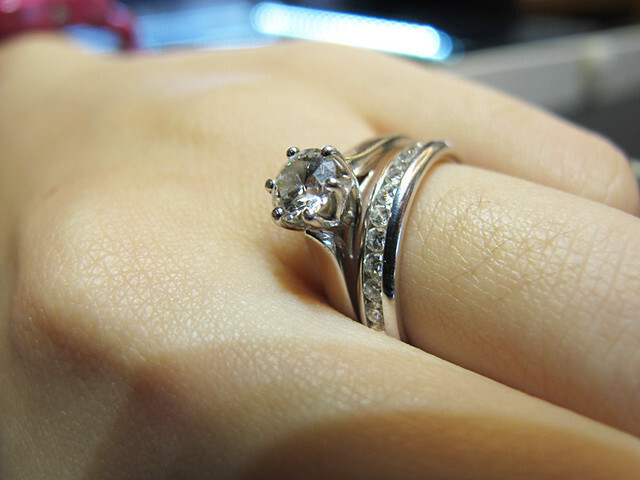 Besides not having a camera that works properly, I was also bogged down by a lot of wedding planning. It’s quite crazy how consuming researching about wedding is. I mean, I sat down thinking I’d give it an hour browsing through vendors and stuff but when I looked at my watched, 5 hours gone. Just like that. One thing I’ve come to conclusion is that wedding not only takes up your money….it takes up A LOT of time too. # – G’s band is actually exactly like mine, only without the rocks. 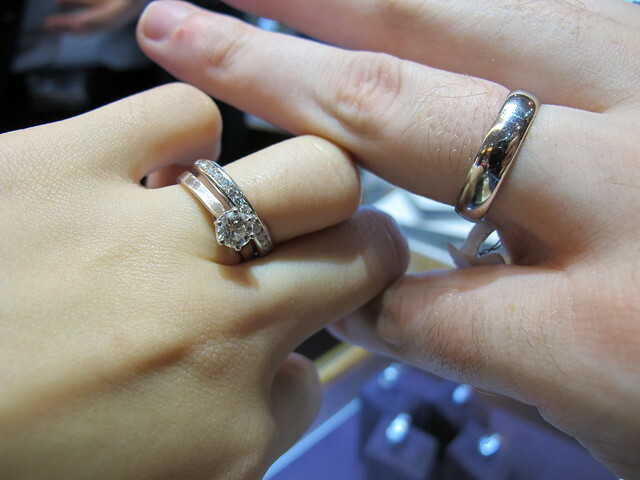 Anyway, we’re collecting the rings in a month, so, so, so excited!!! So with the new camera, cooking mood instantly comes back! So decided to share a Toad in the Hole recipe. Why is it called Toad in the Hole? No idea. How do English people come up with names like Spotted Dicks, Pork Scratchings and Bubble & Squeaks? The chinese always call their foods majestic names, no matter how disgusting they are but the english name theirs after genitalia, unattractive habits and slimy animals. Weirdos. 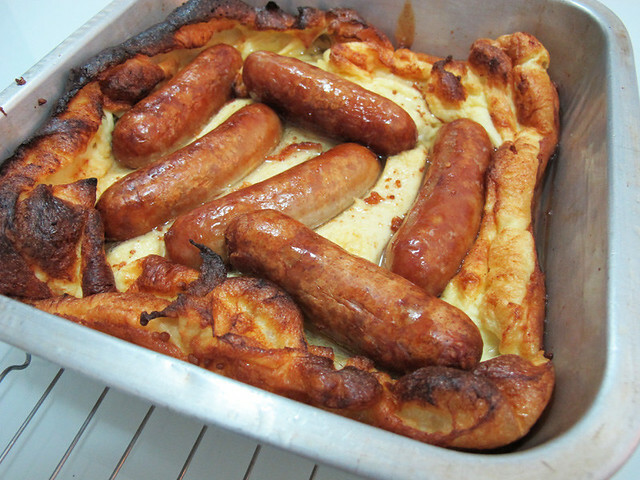 Anyway, toad in the hole is basically sausages baked in yorkshire pudding. OMFG right? # – Toad in the Hole. 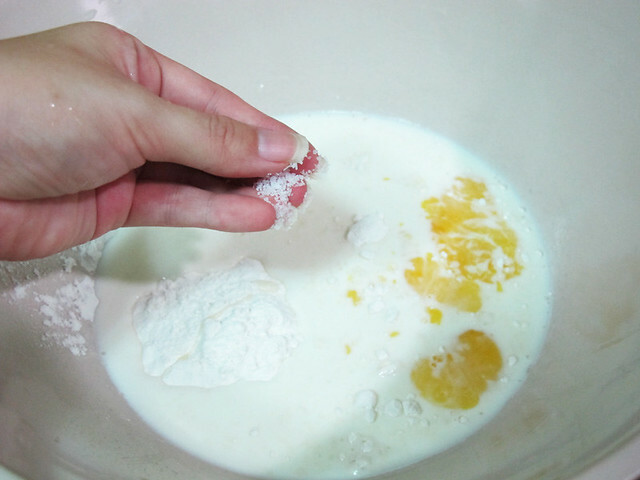 #1 – First, mix flour, milk, eggs and salt in a bowl. 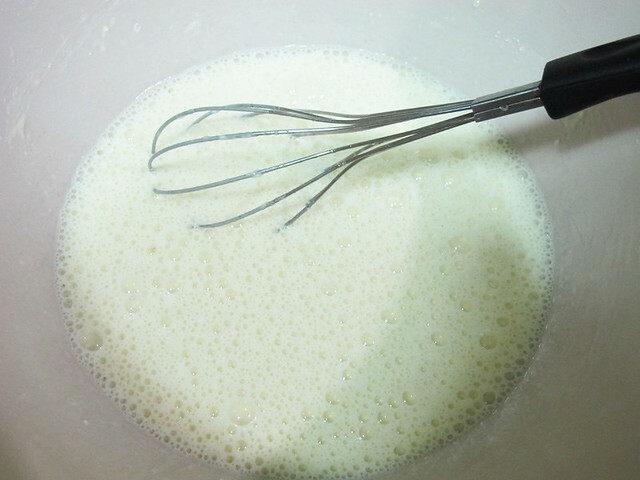 #2 – Whisk hard until combined. This is your yorkshire pudding batter. Leave to stand for 30 minutes. 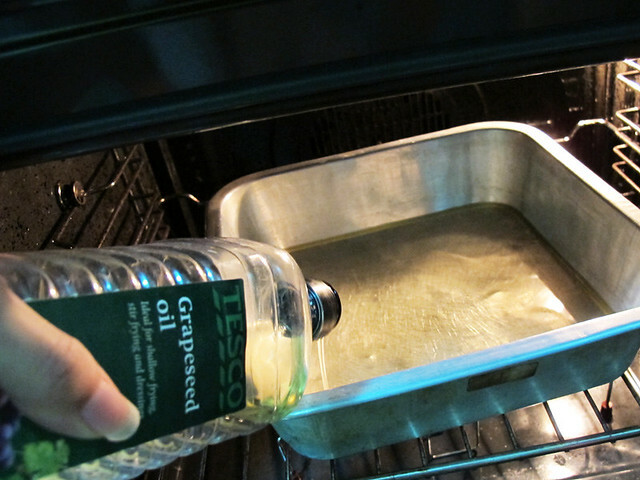 #3 – Heat up oil in a roasting tin (just about cover the bottom) in a preheated oven at 210 degrees celcius. Don’t put too much oil (my picture shows too much oil, I had to pour it out in the end :P) or you’ll get soggy puddings. 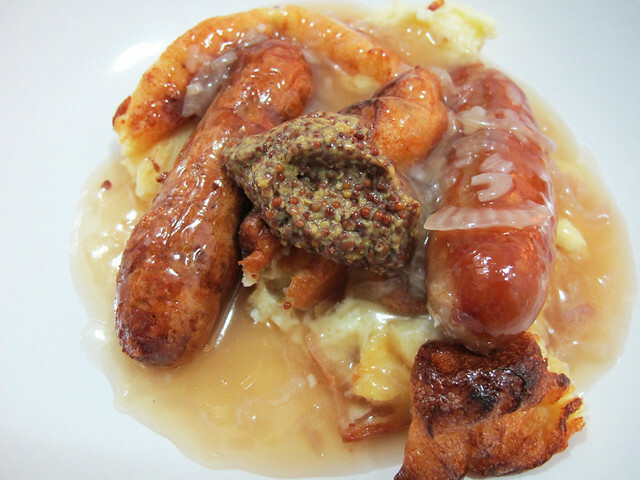 #5 – Turn the sausages all the time to brown evenly. After about 10 minutes, pour the yorkshire pudding batter straight into the roasting tin. Then quickly close the oven door and never open again for 20 minutes. As it is a complex manuever, I didn’t take picture but this is the sight after 20 mins. Puffed up magnificently! 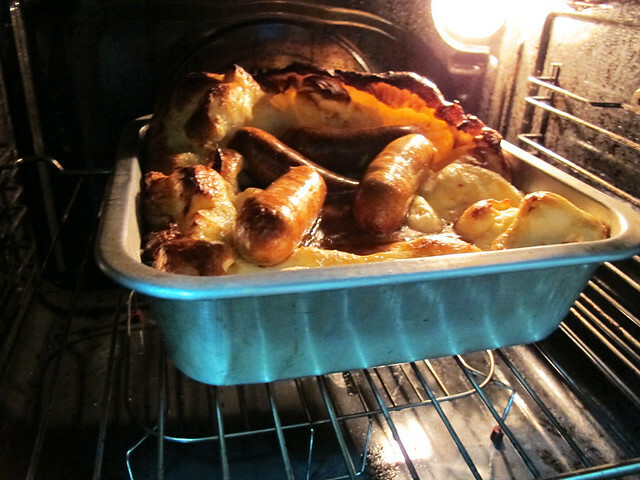 #6 – Toad in the hole, DONE! 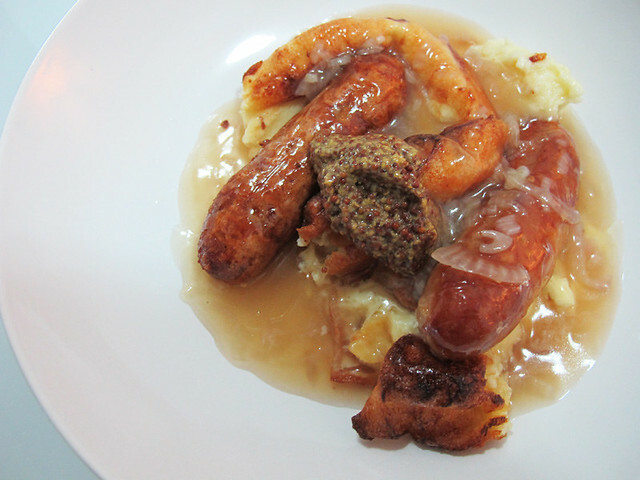 #7 – Serve with a dollop of wholegrain mustard and onion gravy (recipe in next post, very easy to make). Till the next post, hopefully not too far away. Have a good week! I have made a lot of progress on wedding planning since my last post. So grateful that Mom’s staying with me over the week to help me sort out wedding stuff. 1. For one, I have found the dress! I finally understood what people mean when they say, “You know it when you see it”. At first I was quite worried because the first half dozen of places my mom and I went to had stuff that I didn’t really like. Most of the dresses could be summed up as “okay but not quite”. Finally we went to this shop and the girl was showing me a bunch of ball gowns and I was on the verge of giving up explaining to her what I have in mind when suddenly she said she might have something downstairs. Mom and I followed her and then she pulled out something from a large bag. I looked at it and my heart skipped a beat. I was like, please please please let it look good on me and let me look good in it!!!! Then I put it on, and I felt a sensation in my chest, a good sort of sensation…not the type where you want to see a doctor but the type you want to start doing the chicken dance and sing I’m so happy…I’m so happy…I’m so happy and jolly and gay. Nobody has seen the dress except me, mom and people from the shop and I will keep it that way until the wedding day. I don’t even need it altered I think but I reckon when I lose more weight I might nip it in a bit more. As for the evening dress, I’m quite chilled about it…because I want something fun, flirty and a little slutty (lol) for the later part of the reception aka PARTY TIME. 2. We have also found a wedding cinematographer we really like, thanks to a tip from a blog reader. Thank you Yu Jen! We’re meeting them this weekend to discuss the details and hopefully, by then we will have confirmed them. 3. My makeup and hair will be done respectively by Cassandra and Cindy from dominicabyc.com. Cassandra is a BOH Cameronian award winning makeup artiste and I loveeeeee her style. Very chic, clean and natural. Her brides are so gorgeous! 4. Gareth’s wonderful colleague, Chee Ling is helping us design our invites too. We’re loving what she’s done so far and she’s got an awesome idea with the invites which I’m so incredibly excited to share but I have to refrain because don’t want people to steal it *cue maniacal possessive laugh. 5. As for the wedding theme, it’s clearer than ever. I know exactly what to do, how the decor’s going to be, what is the feel and etc. I feel a lot calmer now and ready for some proper ground work. 6. I’ve got my wedding shoes while in Bangkok. I might change it I might not, we’ll see. Not that worried about shoes to be honest. 7. Still haven’t found an emcee, partially because we haven’t really been looking yet. I wish more emcees upload their gigs onto Youtube. 8. Photography will be by Anna-Rina of course. She also took our ROM pictures, which I was so happy with. 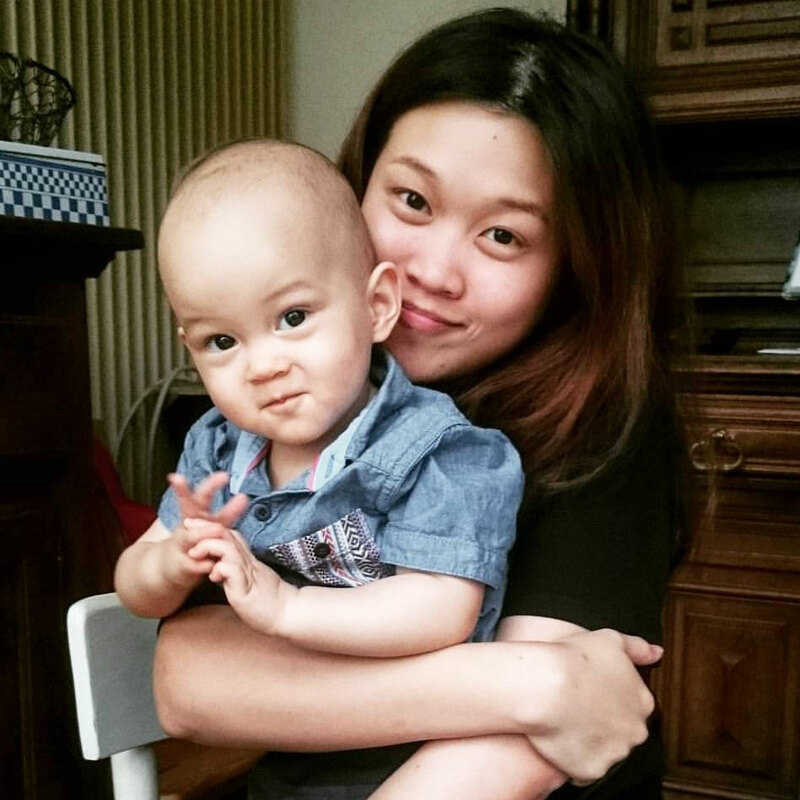 Anna-Rina is great at capturing “moments”, she can speak like a gazillion languages which means she can communicate basically with all my guests (especially the non-English speaking elderly) and best of all, she’s just a bundle of positive energy! 9. We are doing cheesy studio photography. LOL. Yeap, not kidding. I asked specifically for indoor shoot only though, cause can’t be arsed to pose around in the heat in wedding costumes. Oh well, my grandmothers will be happy to hang pictures of us in gaudy gowns and white suit with our eyes closed on their walls. Trolololol. 10. Going to start dieting and exercise more, I promise.